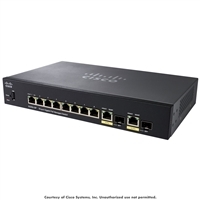 Cisco 350X Series managed switches provide 10 Gigabit Ethernet connectivity for both copper and fiber installations, giving you future-proofing speed and performance without breaking the bank. 350XG switches are truly stackable up to 4 units, allowing you to manage up to 192 ports as one unit. Easy to use and maintain, Cisco 350X switches also are compliant with the Energy Efficient Ethernet standard, saving you on energy costs.